The Michigan Tech Great Lakes Research Center and Portage Lake District Library hosted a special evening program for all ages on Monday, June 29, focused on the Great Lakes and what lives here. Participants began the program at the library where several activity stations were set up indoors and outside. 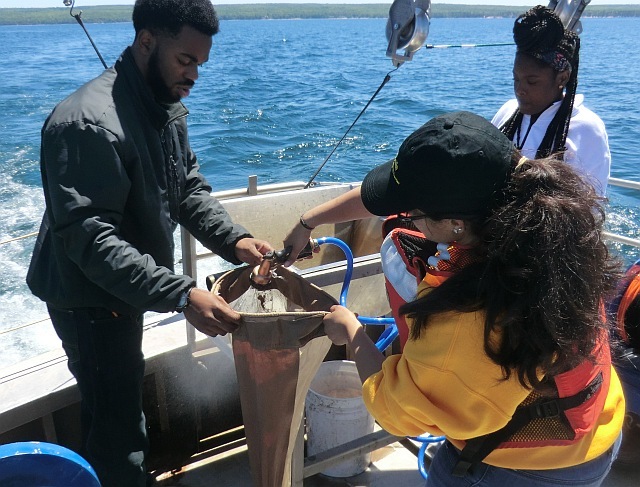 Participants had the option to participate in a scientific excursion aboard the Agassiz research vessel, traveling from the library to the Great Lakes Research Center where they visited a laboratory to use microscopes in order to peer at the tiny organisms and examine a variety of fish. Station 4: Michigan Tech’s Great Lakes Research Center Lab – Compare fish mouth adaptations, view cool plankton under microscopes, and put together a Lake Trout food chain. More than 80 attended, there were four full Agassiz scientific cruises with 18 participants each. I like that there were many activities. I like the college students involved. It gave my daughter a good feeling of going into a college lab. Great time! Everyone was helpful!! Your programs are always extremely educational & fun! Both my children had activities that suited them well—plankton, pH levels. For more information, contact: Joan Chadde at 487-3341 at the Great Lakes Research Center or Chris Alquist at 482-4570 at the Portage Lake District Library. This program is funded by General Motors and the Portage Lake District Library. Twelve Baraga county students are participating in a KBOCC STEM outreach-funded Great Lakes Science & Engineering Camp at Michigan Tech’s Great Lakes research center coordinated by Joan Chadde at the Center for science & environmental Outreach. The KBOCC program provides free science and math enrichment opportunities to middle and high school students in Baraga county. During the school year the KBOCC department provides afterschool and Saturday workshops music, science, math, and engineering . Only 36 faculty across the US were invited to join the Young Investigator Program (YIP) from the Office of Naval Research this year; additionally, only a small percent of faculty receive the CAREER Award from the National Science Foundation (NSF). Nina Mahmoudian, an assistant professor of mechanical engineering-engineering mechanics at Michigan Technological University, is one of a select few to receive both in the same year. 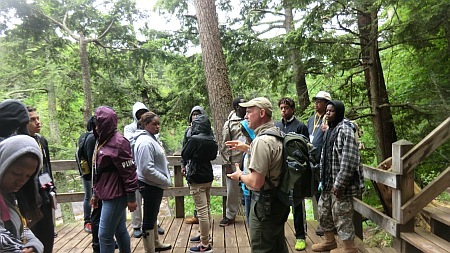 Monday June 15th started an adventure for 20 Detroit high school students who want to explore careers in natural resources, environmental science and engineering—forestry; wildlife; water quality; Great Lakes; environmental, civil and mechanical engineering, and more! Thanks to donations by numerous Michigan Tech departments and offices, students have FREE transportation, food, lodging and an exciting program! Students had a full schedule while at Michigan Tech where they would identify trees, measure forest plots, inventory invasive earthworms, visit the underground rhizotron, participate in a 4-hour Great Lakes investigation aboard MTU’s Agassiz research vessel in Lake Superior, assess the health of local streams; manipulate underwater autonomous remotely operated vehicles, visit labs, conduct insect and wetland inventories, and explore nearby state and county parks to enjoy the beautiful Keweenaw and Upper Peninsula. Students experienced college life staying and eating at Wadsworth Residence Hall. 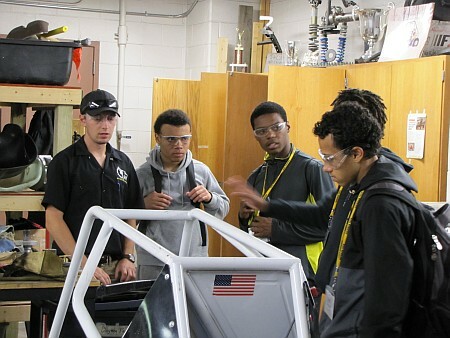 These twenty students successfully applied for this program (first of its kind) and were eager to visit Michigan Tech’s campus, explore future careers, and have new experiences. 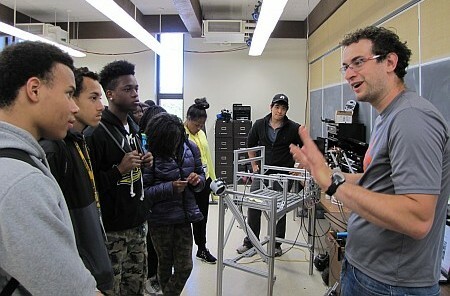 The students are in grades 9-12, and come from eight different Detroit high schools. Many people have helped to make this possible, from help with recruitment in Detroit, to the more than a eighteen experts volunteering their time to present to these youth. The Program is coordinated by Joan Chadde, director of the Michigan Tech Center for Science & Environmental Outreach, in collaboration with Detroit colleagues at the Belle Isle Nature Zoo, Mike Reed, Curator of Education – Informal Programs, Detroit Zoological Society and U.S. Forest Service Urban Connections Program. MTU School of Forest Resources & Environmental Science, Michigan Tech College of Engineering, Michigan Tech Housing & Residential Life, MTU Admissions, Dept. of Civil & Environmental Engineering, Pre-College Outreach Initiative, Michigan Tech Transportation Institute, and the Dept. of Mechanical Engineering-Engineering Mechanics. 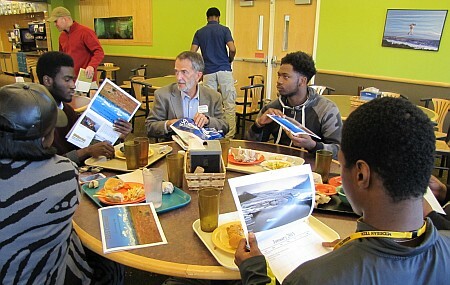 Michigan Tech Dean of Engineering Wayne Pennington has lunch with visiting students. Great Lakes Investigations Aboard Michigan Tech’s Research Vessel Agassiz from June 15 to July 15, 2015 for Students in Grades 4‐12 ~ Fun! FREE! Educational! 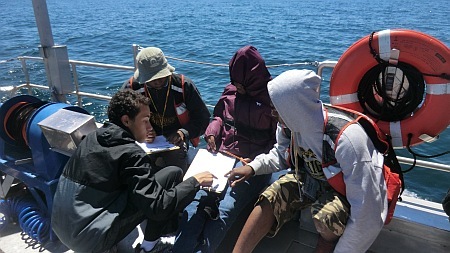 Ride the Waves with GM invites Copper Country youth in Grades 4‐12 to join scientists from Michigan Tech’s Great Lakes Research Center in the exploration of Lake Superior, Keweenaw Bay and/or Portage Lake. chaperones (minimum of 10 is required). Aquatic Food Web & Lab Investigation ~ Measure water quality and collect samples to examine in the lab to find out “How Do You Make A Lake Trout?” All ages. Several 2015 Summer Science Camps were held at Michigan Tech’s Great Lakes Research Center. There were two sessions, one for grades one through three and another for grades four through six. Investigate a variety of science topics from chemistry to geology, wolf and moose to ecology. 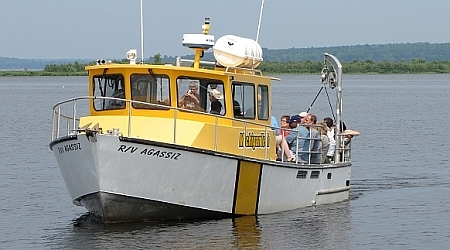 Take a trip on Michigan Tech’s research vessel Agassiz to learn about fresh water ecology, visit a limnology lab and engage in many exciting activities. Instructors include Michigan Tech faculty, staff and students. Sessions are June 16, 17 and 18, from 9 a.m. to 4 p.m. (students bring their own lunch). These camps were sponsored by the Western Upper Peninsula Center for Science, Mathematics and Environmental Education. 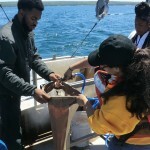 A group of 13 Keweenaw Bay Indian Community youth took part in an immersion experience in Science, Technology, Engineering and Math (STEM) education and careers, May 26 to 30, 2015 on Isle Royale. 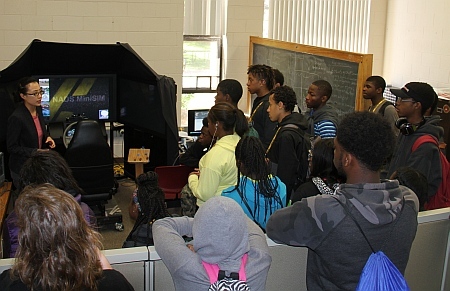 The program, entitled “MAAMAADIZI II”, was co-sponsored by the Keweenaw Bay Indian Community, the Cedar Tree Institute of Marquette, the Isle Royale Institute and Michigan Tech’s Ride the Waves with General Motors Program. MAAMAADIZI, meaning “the Journey begins” in the Anishinaabe language, sought to immerse students in a wilderness environment rich in both scientific and spiritual content. A diverse community participated in the Journey, including spiritual advisors, artists, scientists, chaperones, graduate student mentors and KBIC drummers … a grand party of 32 travelers. Isle Royale National Park provided an ideal wilderness setting for this important work. The Michigan Tech team of 6 members traveled to Isle Royale aboard the R/V Agassiz with Captain Stephen Roblee at the helm; the rest of the party came across on the MV Ranger III. Once on the island, the R/V Agassiz provided transport to campsites, ferry service for on-island field trips and served as a platform for STEM offerings. KBIC students, MTU graduate student mentors and chaperones camped for two nights at Daisy Farm, with the entire party moving to Tobin Harbor Cottages for the last two nights. STEM Science was presented through water quality measurements (light and temperature sensors, Secchi disk transparency) and collections (plankton and bottom organisms) made in Moskey Basin and in the open lake from the R/V Agassiz. Samples were examined on board using microscopes and dissecting scopes. The STEM Science program was led by Dr. Marty Auer of Michigan Tech supported by graduate student mentors Varsha Raman, Aubrey Scott and Nathan Zgnilec. STEM Math was presented within the context of mass and compass (on land, Jon Magnuson, Cedar Tree Institute) and vessel navigation (on the water, Stephen Roblee, MTU). Hikes to Mount Ojibway and an R/V Agassiz cruise around ice-encrusted Blake Point to a shipwreck site on the Palisades provided the venue for STEM Math offerings. Students also participated in Art and Spirit Projects led by artist and illustrator Diana Magnuson of the Cedar Tree Institute. Ken Vrana, Director of the Isle Royale Institute, guided students on hikes and on field trips to Rock Harbor Lighthouse, Edisen Fishery and the Island home of the Isle Royale Wolf-Moose Project hosted by MTU’s Rolf and Candy Peterson. The Journey was wrapped up with a Feast prepared by the Rock Harbor Lodge, a Ceremony hosted by the Keweenaw Bay Indian Community Drum and an evening campfire with S’mores. The KBIC, particularly Lori Sherman and chaperones Richard Wickstrom and Katrina Ravindran, deserves special thanks for logistical and financial support. The Isle Royale Institute contributed financial and made other contributions which greatly enriched the experience. The R/V Agassiz and Captain Stephen Roblee were made available through Ride the Waves with General Motors. 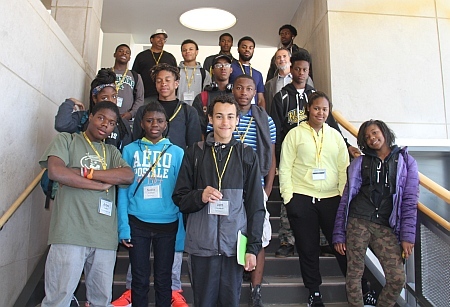 Wilderness STEM experiences with KBIC youth were originated in 2013 by Jon Magnuson of the Cedar Tree Institute and Marty Auer of Michigan Tech and, with support from General Motors are now in their third year.